The only highbanker on the market with a 98% efficiency guarantee. 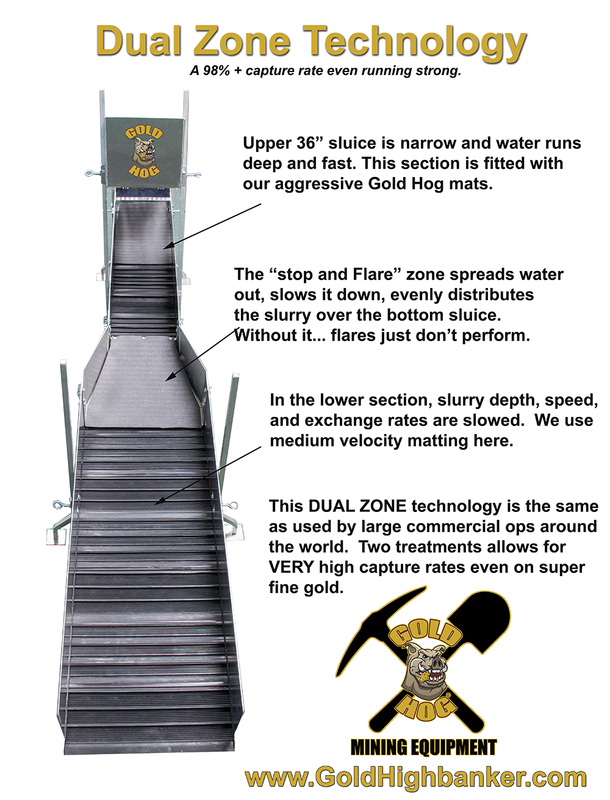 Our #1 Selling Gold Highbanker, the Raptor Flare is the perfect size for most gold prospectors and small groups. 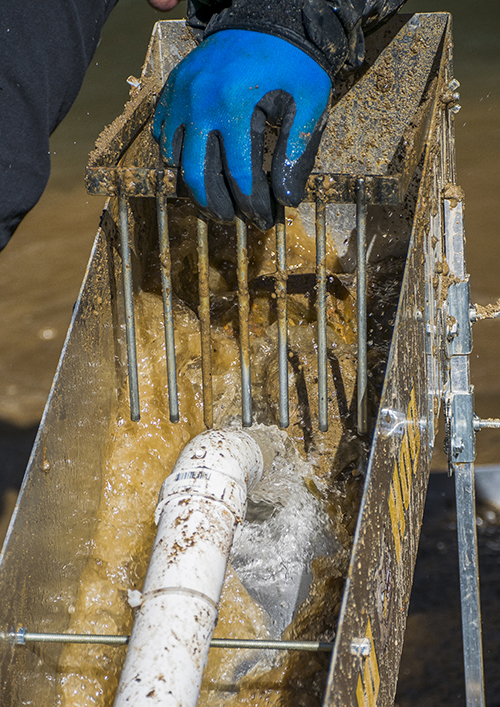 It can run a HUGE amount of material exceeding 100 buckets per hour. The video below explains it all. There have been two small changes for 2019. Please see the → owner’s manual for updates. Change #1 – Metal locking rings now hold the plumbing in place vs. plastic ring. Change #2 – There no longer is a “water stop” bar in flare section. Breaks down into a compact unit that fits into a trunk. Comes with all matting pre-made and installed. POWERFUL header box action DESTROYS dirt and clay. Will capture nuggets up to 1/2″ and SUPER fine flour gold. Optional extension for those running VERY HEAVY / lots of pay. Can keep 4-6 people busy. 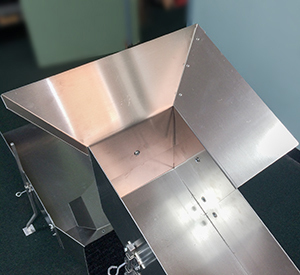 Used by commercial ops around the world for accurate testing. Canada orders are shipped via USPS Priority mail. The total shipping time including customs is roughly 7 – 12 business days. DON’T freak out if you click on the tracking info. For years it has never reported correctly. We ship there all the time without any issues. You are responsible for any fees and taxes. PHONE NUMBER is required for customs. International orders see this page. Our header box flares are a SELF INSTALL product. Doc has made a video on how to install them and he usually only installs 2 sides while running. Only sold to Raptor Flare customers at time of purchase. The extension is needed for those running LARGE amounts of pay or that are in areas which mainly have SUPER fine gold. 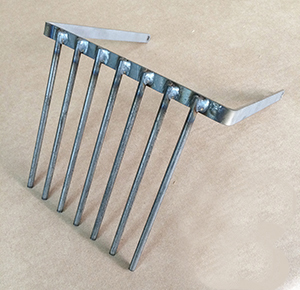 It has a combination of matting including our Motherlode mat and comes with legs and brackets. 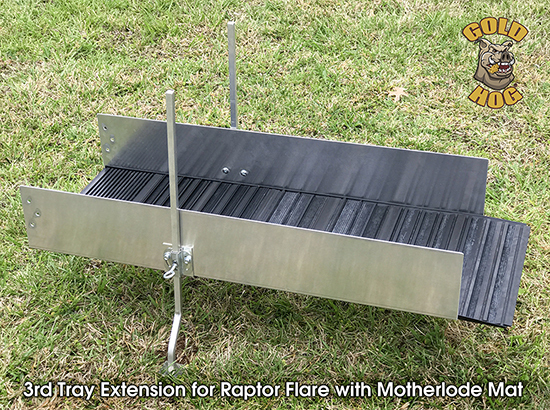 1) Set up your Raptor Flare like you’re about to run it. 2) Insert mat into the extension with legs attached. is gently resting on the new extension mat. drill the rest of the holes. When you first start to run you may see a little water leak out between trays, that’s normal. It’s the vortex created and why we start with a Talon mat. Eventually mud and silt will plug up those leaks. Besides… we have tested the leaking water and never found any gold. 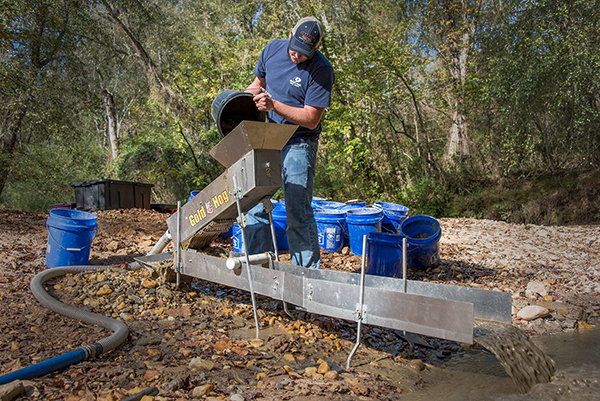 The optional clay claw holds rocks in the header box until YOU decide to release them. The dual zones allows for both large gold and fine gold to be caught in the same run.